Designed to restore the natural curves of the spine and the mobility of the joints. Focus on toning your muscles, improving your balance and alignment. It is gentle on the joints, focuses on suppleness and strength. It helps improve performance, reduce injury, and relieve stress. Great for rehabilitating specific issues with the active aging. Reformer exercises help build core strength, tone muscles, release back pain, and rehabilitate joint injury. Working against resistance from below, back or front gives you all around effect and quick feedback. It is a great complement to your yoga practice, or helps perfect your golf swings, or stabilizes your knee and ankle alignment during running. 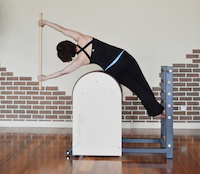 Reformers may be used in our Equipment Pilates class. It is a unique Pilates cardiovascular class which allows for plyometric activity for extended periods of time. Plyometrics training (jump training) gives you the benefits of high calories burn, enhancing sports performance, building muscle power, and improving endurance. Yet it is low impact on joints (safe for bones). Full-body training for all levels; great for people who are limited to exercising in a vertical position. Many exercises are done sitting, standing or kneeling, which promote more functional postures and improve everyday movements. Because of the smaller base of support and adjustable spring tension, it can challenge your strength and stability more than other equipment. Stability Chair may be used in our Equipment Pilates class. Used in a private class setting, the Cadillac offers an extensive range of applications for every intention, from pain relief to body sculpting to sports enhancement. It provides the perfect place to practice multi-planar strength and flexibility movements. The arms and legs are to be working independently to ensure muscle balance in the upper and lower body as well as stability through the core. The 3-dimensional movements on the Cadillac facilitate your daily sitting, standing or lying positions. For every fitness level and ability. There are 3 types of Barrels: the Ladder Barrel, the Spine Corrector, and the Arc Barrel. Barrel exercises are great complement to Mat and Reformer workouts. They help strengthen the abdominal, back and shoulder muscles, and to keep the spine strong and supple. The curve surface helps the chest open up, back straightened and shoulders stabilized. They are useful tools for providing relief from tension or injury. 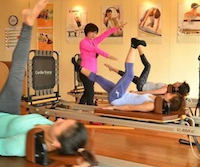 We use STOTT PILATES® equipment from Canada, one of the highest levels in the industry, in our group and private classes. We have full studio equipment including V2Max Reformers with vertical frames, Cadillac/Trapeze Table, Stability Chairs, Ladder Barrel, Arc Barrels and Cardio Tramps to ensure the effectiveness and safety in our classes. 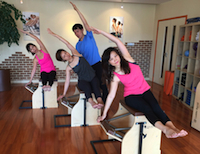 We are the first host training center for STOTT PILATES® education programs in Mainland China. All of our Pilates instructors are also certified under the STOTT PILATES® system.